Rethink Resources offer training and support, helping individuals find apprenticeships and employment opportunities. The team look to build on the skills people already have to help them succeed in their search for employment or new opportunities. 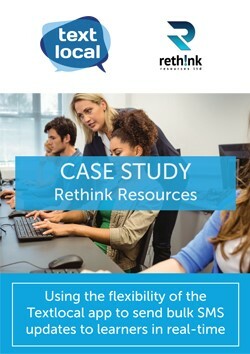 Rethink Resources needed a quick way to easily update their learners in bulk, reminding them of course details, changes to times and inviting them to open evenings. The solution needed to incorporate the ability to bulk send and enable staff to send updates on the go. The team were able to use SMS to send regular communications in bulk to their contacts, encouraging higher enrolment rates and an increase in attendance at particular events. Rethink Resources was also able to utilise the ease and speed of the Textlocal app, allowing team members to send messages while on the go. The whole team are very happy with the flexibility and speed of the system, making it easier than ever for them to share and communicate with their learners directly and even on the go through the Textlocal app.